Free Printable Hulk Word Search. Print free Hulk Word Search from Hulk Comics, Hulk Movies and Marvel animated series. Share with your kids, friends, students and everyone that loves Hulk “The Incredible Hulk” and Marvel comics and MCU. Great activity for school, a movie night before you watch Avengers Endgame, birthday party or just to have fun. Find words, characters and enemies related to Hulk like Anger, Gamma Rays, Hulk Smash, Bruce Banner, Strength, Doctor, Planet Hulk, Avengers, Betty Ross, Maestro, Green, Hulkbuster, Absorbing Man, Superhero, Abomination, Onslaught and many more. Find 24 words in this fun activity and the solution on page 2. The Hulk Word Search puzzle is ready to print free in PDF format. Free Printable Thor Word Search. Print free Thor Word Search from Thor Comics, Thor Movies and Marvel animated series. Share with your kids, friends, students and everyone that loves Thor “The God of Thunder” and Marvel comics and MCU. Great activity for a movie night before you watch Avengers Endgame, birthday party or just to have fun. Find words and characters related to Thor like Asgard, Galactus, Hela, Ragnarok, Gaea, Earth, Odin, Galactus, Marvel, God Blast, Hammer, Loki, Surtur, Nine Realms, Sokovia, Thanos, Superhero and many more. Find 24 words in this fun activity and the solution on page 2. The Thor Word Search puzzle is ready to print free in PDF format. Free Printable Captain America Word Search. Print free Marvel Captain America Word Search from Captain America Comics, Movies and animated series. Share with your kids, friends, family and everyone that loves Captain America and Marvel comics and MCU. Great activity for a movie night before you watch Endgame, birthday party or just to have fun. Find words and characters related to Captain America like Shield, Super Soldier, American Flag, Superhero, Strength, Serum, Civil War, MCU, Avengers, Hydra, Bucky, Sharon Carter, Falcon, Winter Soldier, Red Skull, Doctor Faustus, Nuke, Steve Rogers and many more. Find 24 words in this fun activity and the solution on page 2. The Captain America Word Search puzzle is ready to print free in PDF format. Free Printable Spider-Man Word Search. Print free Marvel Spider-Man Word Search from Spider-Man Comics, movies and animated series. Share with your kids, friends, family and everyone that loves Spider-Man and Marvel comics and MCU. Great activity for a movie night before you watch Endgame movie, birthday party or just to have fun. Find words and characters related to Spider-Man like Venom, Mary Jane, Mysterio, Uncle Ben, Aunt May, Green Goblin, Costume, Agility, Superhero, Web Shooter, Avengers, Vulture, Carnage, Norman Osborn, Doctor Octopus and many more. Find 24 words in this fun activity and the solution on page 2. The Spider-Man Word Search puzzle is ready to print in PDF format. With great power there must also come great responsibility. Free Printable Iron Man Word Search. Print free Marvel Iron Man Word Search from Iron Man Comics, movies Iron Man, Iron Man 2 and Iron Man 3 and animated series. Share with your kids, friends, family and everyone that loves Iron Man and Marvel comics and MCU. Great activity for a movie night before you watch Endgame, birthday party or just to have fun. Find words and characters related to Iron Man like Titanium Man, Stark, Pepper, Tony, Technology, Missiles, Armor, Mandarin, Suit, Gauntlet, Avengers, Extremis, S.H.I.E.L.D, Ultron, Arc reactor, Hulkbuster, Hero and many more. Find 24 words in this fun activity and the solution on page 2. The Iron Man Word Search puzzle is ready to print in PDF format. Free Printable Lego Word Search. Free Printable Lego Word Search about Lego Movies, Minifigures, Themes and more. Print this fun activity and share with all lego fans, friends, family and everyone that loves Lego. Great activity for Lego birthday party or just to have fun. Find words and characters related to Lego like Max, Emmet, Technic, City, Creator, Lucy, Brick, Benny, Stud, Overwatch, Minifigure, Duplo, Ninjago, Star Wars, Nexo Knights, Lego Friends, Unikitty, Elves, Boost, Juniors and many more. Select from 24 and 12 words activity and the solution on page 2. The Lego Word Search puzzle is ready to print in PDF format. Free Printable Easter Matching Worksheet. Free Printable Easter Matching Worksheet activity for a fun Easter celebration and also to help kids practice writing skills. Print and share this free printable Easter Matching Worksheet at school, tutoring, homework, or print for your kids at home. Your kids can match the Easter images with the correct name and then practice writing skills. Kids can match 8 words like Basket, Bunny, Grass, Candy, Chick, Eggs, Flowers and Nest. Print this free Easter Matching Worksheet and share with your kids and students this month of April. Happy Easter! Free Printable Easter Word Scramble. Free Printable Easter Word Scramble, a fun activity for Easter party or celebration. Unscramble all the Easter related words in this fun puzzle at home, school or Easter themed activity, party. The free Printable Easter Word Scramble includes a list of 20 scrambled Easter related words like Chocolate, Marshmallow, Candy, Sunday, Hop, Peeps, Bunny, Basket, Eggs, Hunt, Hide, April, Chick, Easter, Dye, Candy and many more. You can find the answers list in page 2. 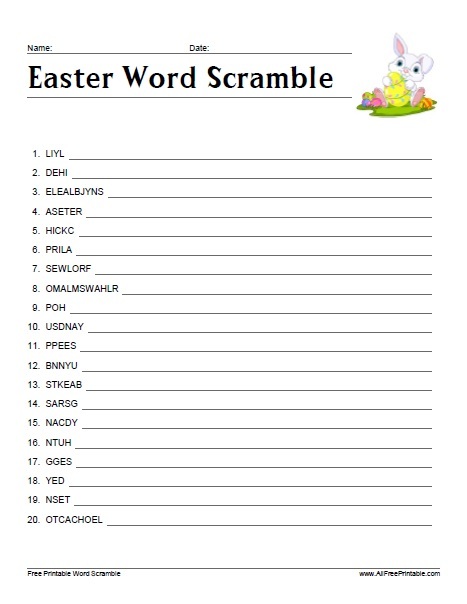 Click the link below to download or print the Easter Word Scramble game free in PDF format. Free Printable Spring Word Search. Free Printable Spring Word Search, a great activity for this year Spring Season. You can use the Spring word search puzzle to share a fun activity with kids, family, students and friends this spring season. Print it free using your home or office printer and have fun searching 24 Spring related words. Find Spring related words like Season, Butterfly, Sunshine, Chick, Birds, Flowers, Nest, March, Garden, Seeds, Bees, Picnic, Rainbow, Eggs, Green, Easter, Tulip, Bunny, Blossom, Flowers and many more. You can find the solution in page 2 of PDF. Click the link below to download or print the spring word search activity now free in PDF format. Happy Spring! Free Printable Mardi Gras Word Scramble. Free Printable Mardi Gras Word Scramble, a fun activity for Mardi Gras party or celebration. Unscramble all the Mardi Gras related words in this game at home, school or Mardi Gras themed birthday, party. The free Printable Mardi Gras Word Scramble includes a list of 20 scrambled Mardi Gras related words like King Cakes, Purple, Floats, Parade, Beads, Crowds, Queen, Green, Fat Tuesday, Masks, Music, New Orleans, Dancing, Carnival, and many more. You can find the answers list in page 2. Click the link below to download or print the Mardi Gras Word Scramble game free in PDF format.